Siané is a female elf of young adult age who is slightly on the taller side. Her tan skin is darker than most Sin- or Quel'dorei, and her bright blonde hair unseen amongst Kal'dorei, but it's not just due to her contrasting coloration that it's hard to say exactly which race of elf she is -- the color her eyes glow doesn't match any of the elvish races, either. Instead of white, green, or blue, they grow gray. She wears light robes of a simple design and carries no visible weapons. Around her neck is a choker of folded mithril with an Azerothian diamond in its center, a small sigil of a sun and sword engraved on its surface, and on one wrist is a silver cuff bracelet. Those with magical senses can discern that she possesses powers in both the Light and the fel. Meanwhile, those who are able to read auras or sense souls will find that there is something strange about hers. Her choker and bracelet both glimmer with arcane energy, and she carries two artifacts of power, one a Loa fetish, and one of a dark ancient nature. Siané walked into the Darkmoon Faire without remembering how she'd gotten there, or anything else for that matter. A Silvermoon magister who was present took an interest in her and brought her to Silvermoon. 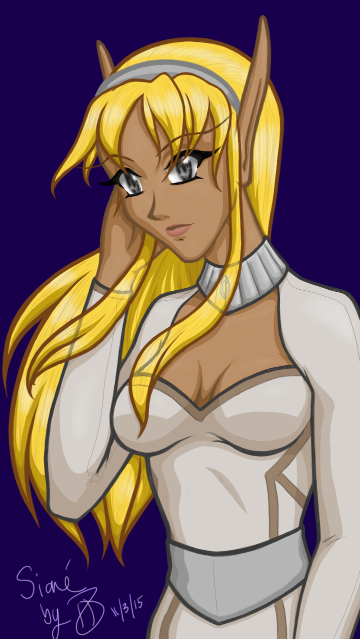 Later, after meeting someone who seemed to recognize her, Siané started staying at Sanctuary Garrison. After that, she learned two things: that she apparently lacked a soul, and that she shared the appearance of the person who was known as Vionora Minara. However, Siané knew that she could not be in any way the same person, having been told that Vionora sought to destroy the world and herself with it, and just the idea of hurting anyone rendered her aghast. Wanting to support peace, Siané took a role as an Emissary for Sanctuary, and joined Twilight Empire as well to become an Ambassador. For both guilds, she began serving as a liaison between Horde and Alliance. However, she encountered numerous difficulties as many held Vionora's actions against her, or sought to use her for their own ends as they discovered her inexplicably soulless condition. Syreena and Shokkra stabbed her; Ardyan tried to study her condition to find out how it had been achieved; and Malhavik began manipulating her to his own purposes, not only getting her to tell him information of Sanctuary's activities, but plotting a dark revenge of his own, while ostensibly helping her learn how to use the fel. Although many came to her defense when she was threatened, believing in her innocence, she was also at one point captured and tortured by the Grim. During this time, Zakael, a shadow priest, fell in love with her, and they began a relationship. Then, one person began to literally put the pieces together when he obtained the soulstone that still held a fragment of Vionora's soul and brought it to Siané. The lingering shade of Vionora almost subsumed Siané's personality -- Siané's worst nightmare -- but Vionora didn't want that to happen either, and begged to have her existence ended. Tirien made the difficult choice and granted her wish, yet the moment Vionora's soul was ended, Siané ceased to live. However, Tirien had used a warlock's soul transfer dagger to destroy the soulstone, and was able to use the stored energy to revive Siané. As a result, Siané did gain all of Vionora's memories... but did not become Vionora. Siané knew and accepted that she had once been Vionora, but the memories to her were of a past life, and the inescapable sorrow that had driven Vionora into tragedy did not touch her. She also gained a portion of a soul so she was no longer soulless, though her soul remained incomplete. After that, Siané began learning how to use shadow and fel magic on her own. She also began studying trollish Loa under Drak'zon in an effort to find a way to restore her entire soul so that she would be able to experience life fully, as Vionora's memories had shown her that there were emotions she could not feel. Zakael proposed to her, but she turned him down, explaining that she did not see herself as the marrying kind. She maintained a relationship with Tirien, caring about him greatly, though it was apparent that on his end, after everything he'd been through with Vionora, that ship had sailed. As for Malhavik, she confronted him about his motives, but realized she could never trust him again, as things were forever changed with him as well. Last edited by Siané on November 5th, 2015, 5:00 pm, edited 1 time in total.